The implementation of this grip strengthener is not only phenomenal to relieve tendonitis but, it has a dual effect to relieve any pain in the adjoining wrist area. This simplistic design includes a knob which is used to adjust strain levels. The handle is wrapped with a spongy rubber that is gentle to the touch. The tension within the stainless-steel spring of the device generates a good stretch throughout the palm area to relax and ease stress taken on by mundane daily tasks. The tension shocks in this tool are perfect for building up resistance training throughout the whole hand. This exercise is ideal for combating carpal tunnel and arthritis. It relieves tension in the finger muscle tissue and relaxed the joints. Devotes to the top and bottom create perfect crevasses for fingers to lay and fold around the tool. This apparatus is easily adjusted to fit easy, moderate, and difficult levels. These two efficiently designed stretchers are made to last! The rubber band can fit in just about any tiny space making it a necessity while traveling, lounging at home, or sitting in a meeting. With a sleek but simple design, this magnificent stress relief tool is lightweight, making it compact and easy to carry anywhere. The products used to make this gel ball can easily be condensed while still being able to transform into original shape when decompressed. ✔️ HAND EXERCISING GRIP STRENGTHENING SET - Reduce the risk of cardiovascular events by doing exercises with your hands. The tools included in this bundle is all you will ever need to strengthen your wrists, forearms, fingers and lower risk of heart disease. ✔️ HAND AND WRIST REHABILITATION- Ideal for reducing stress, relief, anxiety, stiffness and joint pains. Also helps with pathologies such as carpal tunnel syndrome, nerve injury, rheumatoid arthritis, neuromuscular disorders, tennis elbows, tendon injuries and even flexibility physical therapy after surgery. ✔️ QUICKLY IMPROVE YOUR PERFORMANCE - Great for musicians such as pianists, guitarists, saxophonists, clarinetists, drummers and many more. Strengthening grips for athletes such as tennis players, golfers, bodybuilders, rock climbers, gymnastics, yogis, fitness and CrossFit athletes from beginners or intermediates to elite professional trainers. ✔️ PERFECT GIFT FOR FAMILY AND FRIENDS - Comfortable rubber ergonomic design and Heavy-Duty gripper, egg shaped squishy squeeze ball, workout bands provides comprehensive exercise that fits all hand sizes. Excellent squeezable for kids, teens, boys, girls, men, women and elderly. ✔️ 100% CUSTOMER SATISFACTION GUARANTEED - EBOOK and VIDEO created by a professional trainer to help you create your own routine. We stand behind our brand and we give LIFETIME WARRANTY on all our products!!! 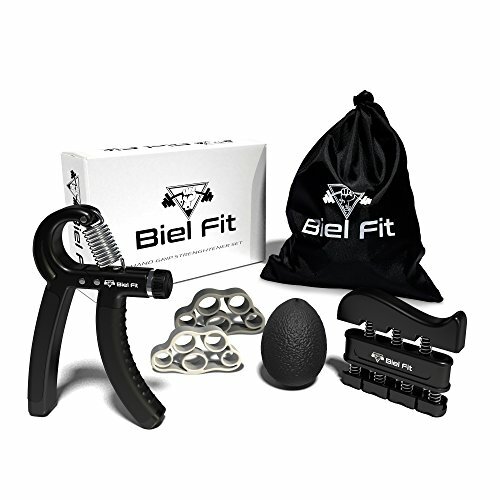 If you have any questions about this product by Biel Fit, contact us by completing and submitting the form below. If you are looking for a specif part number, please include it with your message.